We all know that patios provide a wonderful space to enjoy the warmth and relaxation of spring, summer, fall and depending on where you live, winter. For this reason, it is always a good idea to maintain or update your deck when it starts to fall apart and/or look outdated. All decks are not the same. Many vary in material, features and design. Often, people choose premium products like composite decking, which an attractive, low maintenance finish. However, with it comes a few disadvantages as well. So when your looking at the pros and cons of composite decking, take the time to make the decision is the right for you. The fact is, there are many products on the market depending on your location. As for materials, most composite products are manufactured from wood by-products, such as sawdust, wood chips or recycled plastics. Often, combining synthetic and organic materials seems to capture the best of both worlds (looks and durability), and creates a durable product that looks and feels similar to wood decking. Probably the most popular benefit of composite products is their longevity since composite deck materials can withstand the most severe weather conditions for decades without any additional treatment or protection. This is a huge advantage to those who hate to spend time and money treating and maintaining their wood decks. Another advantage of composite decks are that they come in a variety of colors and textures. You can even create a multi-colored outdoor living space without too much trouble by combining different composite colored boards into a single deck project (i.e. lightly colored deck boards bordered with darker tones for a more dramatic look). Since composite decks don’t need to be painted, stained, or treated. There is normally no need for annual or twice a year care. Keep in mind your typical wood deck will weather, fade, crack, and split as it dries over time. Therefore, In order to keep a pressure treated deck looking it’s best, you need to put in ongoing effort. Functionality of design another big reason why people select composite decks. Many composite lines offer ready to go picket railing, which is similar in style to wood railings. Others, offer a rich looking tempered glass system as well. The ease and easier to design option can also end up saving customers a great deal of money over manually recreating the same look. There are even predone stair and landing designs with many composite products. First and foremost is the price. This is usually mentioned as the largest disadvantage of composite products. IN fact, they can be anywhere from 50 to 100 per cent more than standard treated lumber, though this varies based on your location. While many people select lumber options because they are more affordable, they must recognized the increase cost of labor that should also be considered. The fact is decks typically don’t bring in the same ROI as kitchen or bath upgrade. For this reason, the more you spend on your deck, the less you will get on your investment. But, who things of selling their house when adding one, right? On the other hand, the fact that a deck will last longer with minimal maintenance might help little as a selling point. Like to change your mind when it comes to colors? Keep in mind that composite decking is permanently colored in order to avoid or reduce maintenance. In other words, the color, tint, and shade cannot be changed. Standard wood decks on the other hand can be re-painted, re-stained, or refreshed as desired. 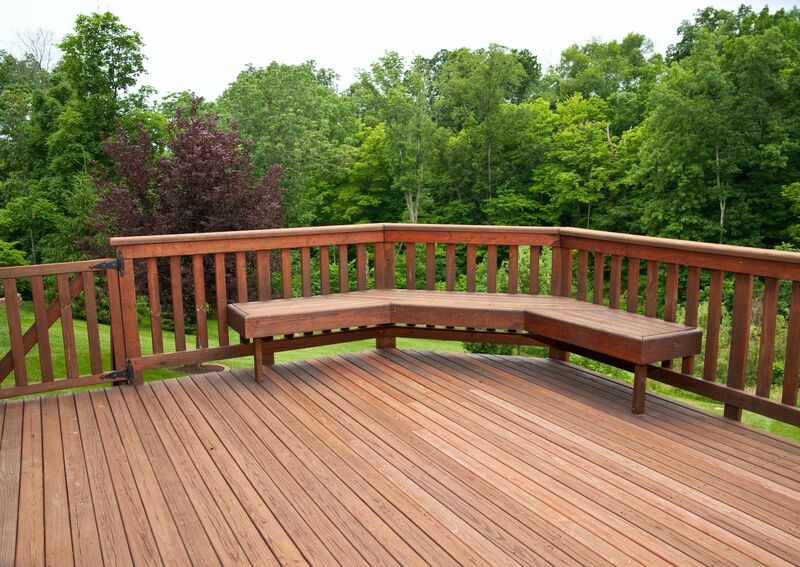 While very resistant, darker composite deck colors may in fact fade over time. This is an unavoidable process that happens due to the UV rays of the sun, weathering, and high foot traffic. Other potential drawbacks over time can include noticeable surface damage. Common issues with composite deck products can include severe scratches and deep gouges - difficult to repair without replacing individual deck boards. So, you are left with the final decision in examining the pros and cons of composite decking. There are many factors to consider, including maintenance, budget, appearance, durability, and availability. If you are thinking of removing your old wood deck and are on a budget, then treated lumber or cedar may be the best option for you. If however, you have a large budget and want to experiment with a long lasting and durable product then you might want to consider composite decking.